This alley is located between 11th and 12th Streets to the north and south, then bound by Santa Fe Street and Mulberry Street to the east and west. Its enclosing brick warehouses host a variety of building uses. Motorbikers and those looking for refreshments can be found at Blip Coffee Roasters. Antiquers can find treasures every weekend at Ugly Glass & Co., Goldie & Myrtle's, or The Painted Sofa. Seasonally, the brave can trudge through the Macabre Cinema House, The Edge of Hell, or the Chambers of Edgar Allen Poe. But within the alleyway itself, activity is scarce. Evidence of incognito activities are left as various tags and graffiti art that cover the first six feet of the brick warehouses. 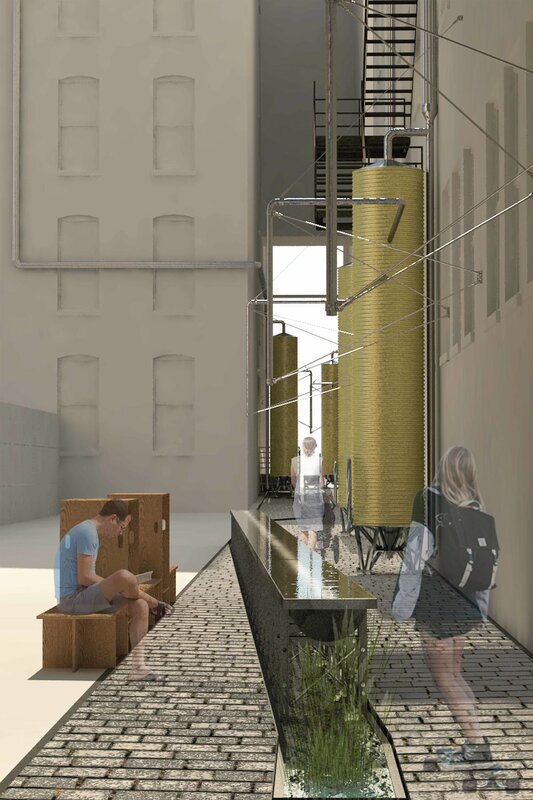 The 12th Street Alley can boast of its excellent view of the last remaining water tower in the West Bottoms. Other views outward include Downtown KCMO and passing trains in the railyard to the east and then a handsome glimpse of the 12th Street Viaduct to the south. The void along the northern edge of the site holds strong evidence of the warehouse building that once stood there. Individual floors and structural connections are articulated in the sides of the adjacent buildings to which it was once attached. The footprint of this void is currently fenced off and privately owned. Despite being housed in one of the densest and most active locations in the Historic Core, it’s existence in not evident as the height of the adjacent brick warehouses, along with its narrow entrances, obscure its presence from the streets. Spatially defined by narrow width, the 12th street alley is vertically liberating. This condition continues throughout the full length of the alley with varying degrees of expansion and contraction of the space. It is perhaps the most enclosed alley in the West Bottoms both in height vertically, and in width horizontally. Water drainage is a relevant issue, due to lack of adequate grading, and surrounding foundations. Downspouts from all adjacent buildings are disconnected from the combined sewer system, emptying the watershed volume into the alley. The uneven ground accumulates puddle that linger for days. The water that manages to infiltrate into the ground restricted, and seeps into nearby basements making them unusable. 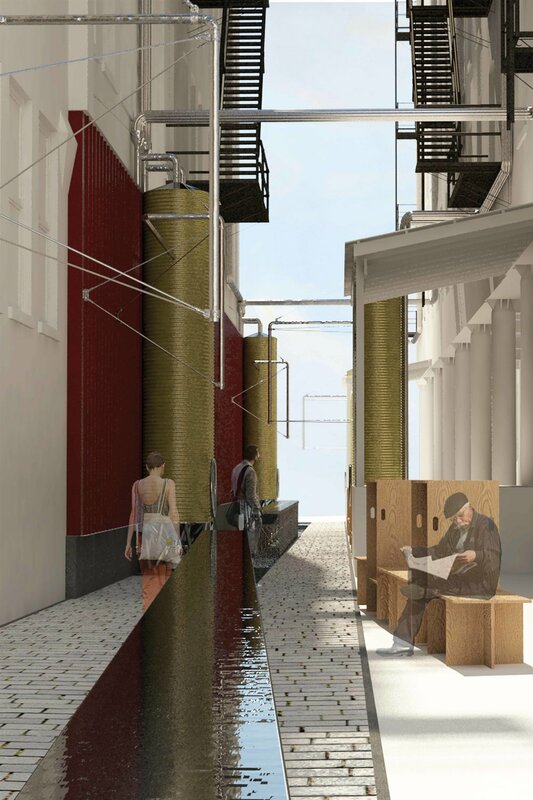 Reflection from the standing water in the alley vertically frames views inspiring an additional sense of spatial expansion, emphasizing the verticality of the existing space. 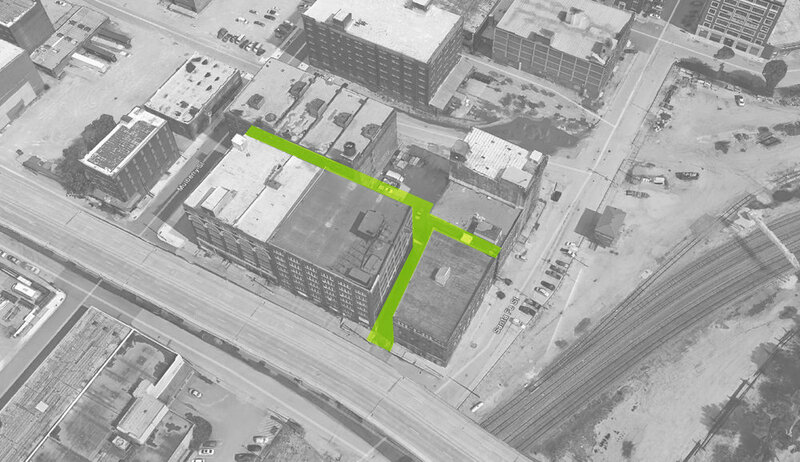 For more information on the preliminary design for the 12th Street Alley site, please refer to the KCDC's project publication for the first phase of West Bottoms Reborn. Spatial Contrast - As the volumes of the alley compress and release, the space’s progressive linear nature has a natural cadence of compression and release that is both comforting and ominous, making it imperative to preserve the space’s harmony. Light - While the entirety of the alley remains relatively dark, the ambient light transforms the place as lightness and darkness reveals and hide the space. Hydrology - With water management being a concern, the ground plane is highly influenced by the need to relocate stormwater. Green infrastructure is integrated in the design to delay the release of water into the combined sewer which can be easily overwhelmed. This combined with unperceivable grade changes would be essential in providing adequate water management out of the space, while including controlled pools to keep the vertical framed views that standing water currently creates. This would also eliminate water seepage into surrounding basements making them usable spaces once more. 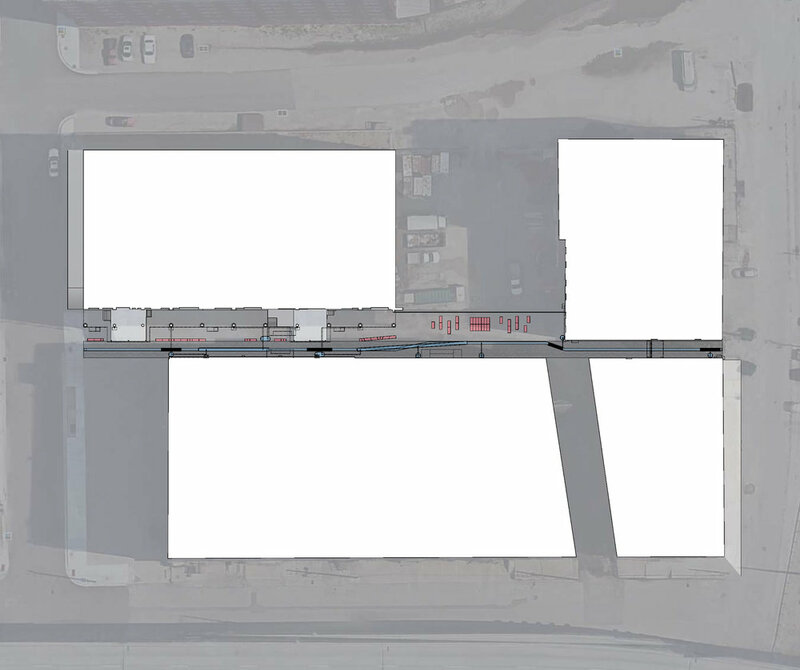 The 12 street Alleyway has great potential to revitalize the local business economy. 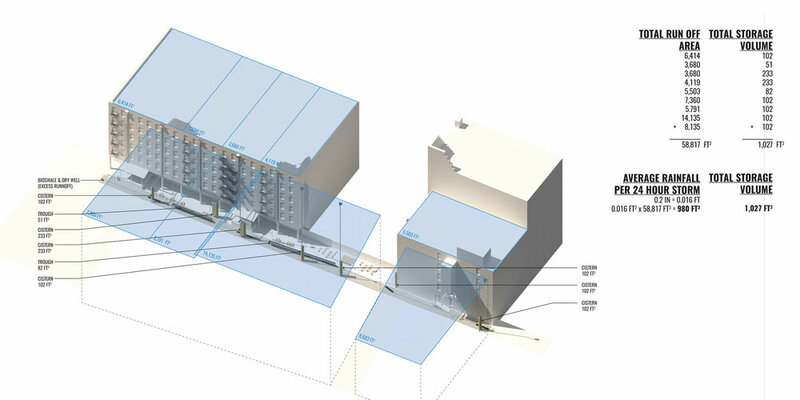 In a cascading effect the activation of the alleyway will lead to increasing activation of the business adjacent to it. This leads to a heighten maintenance of the alley, having a further catalytic effect that is mutually beneficial to both spaces.